The Brigadier would paused dramatically after “frankincense”, and remove his monocle before pronouncing “myrrh” in a rising tone that resounded from the nave to the chancel. These school-day experiences left me with high expectations of Christmas services. The quality of the choral singing was high, and the readings (always from the King James Bible) filled my desire for wonder. I didn’t know what frankincense and myrrh were, but that didn’t matter. Recent experiences of Christmas services have often seemed lacking in comparison. Even those (hard to find these days) that use the traditional Bible text and carols often seem a bit perfunctory, like a ritual whose death is lingering. Two years ago, I attended a service in Auckland at an Anglican church. The leaders took an informal approach but fumbled with a powerpoint presentation that often gave the wrong words for the carol or reading, and there was little recognisable ritual until near the end of the event. 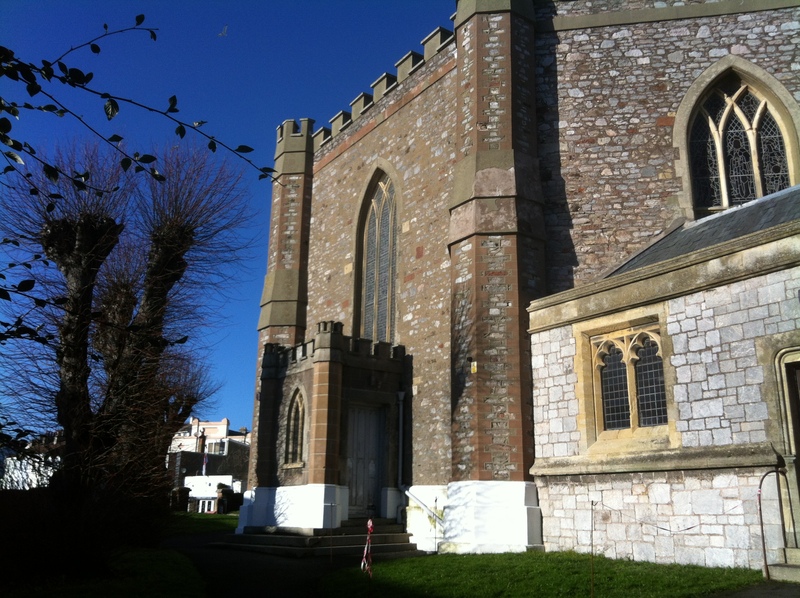 So, as I entered the Teignmouth church on Christmas morning, my expectations were not high. St James’ is an octagonal Victorian church with large stained glass windows: a bright, broad space where the congregation – about forty parents and children – sat close to the chancel. Behind the unobtrusive rood-screen sat an elderly man and woman: the man wore a bright red jumper, and the woman’s white hair fell in waves over her black top. She welcomed us and asked the children: whose birthday was it today? The children, who sat with their parents, seemed comfortable and several gave the right answer, which led to a further question: What do we do on someone’s birthday? “Sing Happy Birthday!” replied a child, and forthwith we did: “Happy birthday, dear Jesus!” I looked around and wondered whether to leave. The service proceeded with crackers (pulled by the clergy and children) that revealed jokes that drew on minimal Biblical knowledge: “How did Noah see in the Ark?” – “With floodlights.” “What did Adam say on December 24th?” – “It’s Christmas, Eve.” The children were invited to come to the front and show their Christmas presents. These were quite modest: a pair of slippers with a fabric animal pocket; a ukulele; some princess dolls. In between these child-centred events, we sang carols (mostly modern but with good tunes) and the children read short passages from the Christmas story. They had to use a microphone to be heard, but they read well enough and were clearly pleased and proud to do so. Towards the end of the service, the atmosphere became more profound. The male leader read prayers firstly for individuals who were sick, lonely, or experiencing bereavement, and then for the problems of the wider world. These were not from any prayer book I recognised, but seemed to be meant, and many people knelt in prayer. The final carols were traditional, and heartily sung. As the parents and children left, they thanked the leaders and looked as if they had had a good time. Despite its apparent frivolity, the service succeeded in engaging the congregation. It wrapped us in a homely, nurturing spirituality very different from the portentousness of King’s College Carols.